"Not a pound for air to ground!" This catchy little phrase was thrown around a lot during the development of the USAF's premiere air superiority fighter, the F-15. It was designed to counter (then-) Soviet threats like the MiG-25, to focus purely on winning control of the air. The F-15 A-D models have done this admirably with the US, Israeli, and Saudi air forces - not a single Eagle has ever been lost in air to air combat. The Eagle truly rules the skies wherever it is flown. With budget considerations and the need for retiring some vintage attack airframes, though (such as the vaunted F-111,) the role of the F-15 was reconsidered. 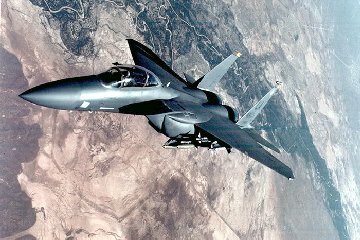 The F-16 Falcon, its lightweight counterpart, had already proven itself to be a capable attack aircraft with just one engine. How much more could be done with a second engine, and second crewman? A twin seat F-15 was taken and modified into the first F-15E Strike Eagle, and a few prototypes were (barely) ready for action when Desert Shield and Desert Storm started. They proved to be as formidable in the air to ground role as their older bretheren were in the air to air role, and are now forming an integral part of the USAF's Air Expeditionary Forces. We'll see Eagles hauling bombs for a long time to come. And once the bombs are done, it's still deadly in the air to air arena. This is a wonderfully designed kit with few flaws. Yes, few... there's one biggie I'll get to shortly. 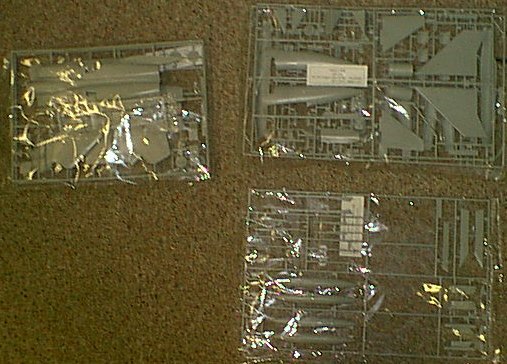 The kit is seperated into several pieces, in ways I haven't exactly seen before. The cockpit and nose are seperated from the fuselage, which is standard for R/M's F-15 kits and, with care, is no big deal. The upper body contains half the wing, though - yes, half. The lower half is added, then the outside upper halves are added. I'm not sure how much of a seam this will create, or just why they did it this way - but they did. Molding throughout looks very crisp and nicely done. The rear afterburner "cans" will take some care - each one has 15 (!) actuator rods! While this may seem like a good bit of work, they look like they'll be worth the effort. There's no way they could have simplified this without the end result looking - wrong. The cockpit is well detailed, as well as the wheel wells (you have the option of closing the nosewheel front door or having it open. Find pictures on the 'net - from what I can see, it'll normally be closed.) Good, engraved detail abounds. This looks like it'll be a great build. OK, gushing aside. I mentioned there was one, major flaw in this kit. What is it? It's not shape, detail, or the like. It's that R/M followed Hasegawa's lead - there is almost no ordinance in this kit! 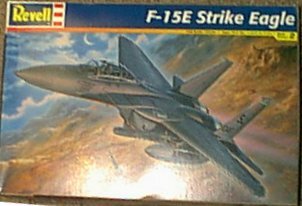 You are given a few AIM-9 Sidewinder missiles, so your Eagle's not completely naked, but... if you look at the sprues, there's a "hole" in them. This is apparently where the ordinance (aka - BOMBS!) were. Rumor holds that the ProModeler release will have the bombs included, but why they weren't with this kit baffles me. The little bit of plastic couldn't have made that big a deal in the final price. Nontheless, you'll either have to deal with a talon-less Eagle, buy a Hasegawa or resin aftermarket weapons set (pricy!) or buy (perhaps) a Monogram A-10 Warthog and steal some ordinance from it. (At $10-$12, it's not a BAD option, or a bad kit.) It'll be a fun build, I think, though the color schemes (overall a single Grey color) might be somewhat boring to some. These haven't gotten extensively weathered, either. Still, it'll be a good looking model when finished. Just be cautious while building, as the monochrome color scheme will make your flaws more visible.